Place the bitter orange juice in a mixing bowl along with the black pepper, allspice and salt; mix well. Stir in the red onions and bay leaves. Char or broil the pepper under the broiler, on the grill, on a hot comal, or in a dry skillet set over medium heat, turning once or twice, until the skin is lightly charred, 3 to 6 minutes. Add the pepper, without removing the charred skin, to the onion mixture and toss well to combine. Marinate at room temperature 30 minutes to 2 hours, then store, covered, in the refrigerator. I made this for my family and used it for fish tacos and oh my goodness! It’s so delicious! I plan on keeping a jar at all times for everything :). I appreciate you so much, thank you for sharing all the food love you do! I make time to watch your show every time it’s on Create. Lots of hugs! Oh I always have a jar in the fridge too, Lori. And thank YOU for tuning in! can you do this with whole pearl onions? I have used this recipe at home and loved it. Now not only am I making this for the school I work at but, I add cucumbers to it. A parent said they did not like cucumbers but, they were good in the recipe!! Hope you feel proud and happy Pati for using this in a school! Awesome! So happy to hear this, Tina! I want to make this recipe but I’m confused. You say you can keep it in the refrigerator for a month but the recipe for the substitute says good for a week????? Oh the pickled onions can be kept in the fridge for up to two weeks, Yvonne. Hope you love them! Made 2 jars today soooo easy and tasty! Super, Annabelle! Enjoy your two jars. I thought Vietnamese pickles were the best but this is amazing ! It’s odd for me not to use any sugar but it’s definitely good without still. I love it , the smell, the colors, the taste! So glad you enjoy the pickled onions, Seanae! Do you have any ideas on how to serve these on top of an appetizer? I was thinking of chopping up pieces of chicharones, putting them on a mini tostada, and then topping with the red onion. Appreciate your help. Oh so many options! They would be great on the tostadas you mentioned, and also guacamole, mini sandwiches, tacos, quesadillas, eggs, and much more. Do you leave the onions in the liquid after the 30 minutes or 2hours or do you throw away the liquid? Keep it in the liquid, it will keep getting better and better. I made pickle red onions.It was very good. That’s fantastic…so happy you liked them! can i pickle radishes, carrots or jalapenos with this recipe instead of using the red onions? Ok I’ve seen you use this recipe a hundred times so I’m going first thing in the morning to make this and the chicken pibil sloppy Joe. I can’t wait since my mouth is watering now! 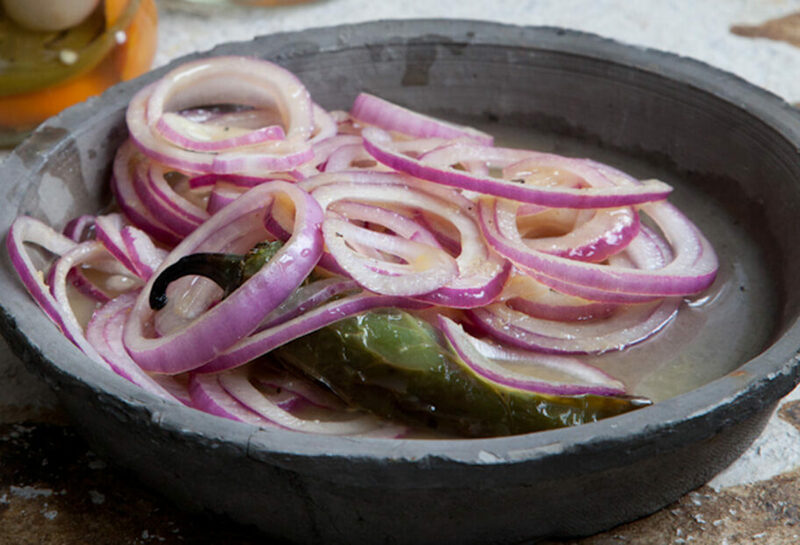 Hi Pati,I watch for show and I finally got the recipe for pickled red onion I make it it’s so good and I love watching your show you have a lot of good recipes my husband is from Yucatan. Thank you so much for tuning in and for trying the recipes. I hope you and your husband enjoy them! Peggy thank you for watching! Hope you enjoy this and many more recipes. Can you add carrots to this. I once had Pickled carrots and onions but I thought they used vinegar. When I lived in Mexico I would make Cochinita Pibil for our friends and served it with pickled red onions. I like your recipe better. These are SO GOOD! I’ll be using your recipe for now on. Thanks Pati! Oh thank you so much Susie! How long can you keep these? Angi, you can keep them up to two weeks in the refrigerator. Are they hot with the pepper and or just spicy. No they aren’t too spicy! Just a pleasant hint of heat. These are so good…I eat them like candy! I love your travels, your family and your recipes…thank you Pati! I love your show, your family, and your recipes…you make everything look so easy and delicious! Will try these soon! Yummy! Thank you Pati! What would be the substitute for bitter orange juice? I had something similar to this in Costa Rica. I have struggled to recreate what I tasted while sitting on that small porch by the sea. This is not the same flavor profile, but I like it soooo much better! I followed your recipe to the letter and it is so delicious. So glad you liked it Jason…I hope you are eating them by the sea…that sounds amazing. Seriously I’ve made this twice and my daughter and I just sit around literally eating onions out of a jar. Just snacking ?